Below is an extensive collection of information on vital subjects of concern for all Americans, and which every American should have knowledge of. This is a collection of facts from many sources, all of which are listed, as well as personal experience. The original has been filed with stated agencies as a matter of my actual file. This document has been updated since March 30, 2006, when the Affidavit was sent to the listed agencies, and is being printed here as a matter of public record and declaration. While I hold copyright to this completed document, (other copyrights noted) you are encouraged to save these web pages to your computer, for personal reference, and as a record of my public declaration of these beliefs. I give limited rights for personal use, as long as no financial gain is attempted from any sale of this document. This is NOT legal advice of any kind but IS a statement of my beliefs based on the law, Constitution and other sources which I make in the spirit of truth and as a patriotic American. It is vital that YOU know and understand the laws, so that YOU can stand on your beliefs and the research into the actual laws that you are responsible to know and comply with as a free living being and as an American who is taking responsibility for the governing of this nation. Copies: Copies of this affidavit and all attachments are being supplied to below listed parties. Please take NOTICE that I hereby add the following updated facts of law in support of this Brief and Memorandum of Law, Affidavit of Truth and Notice of RICO violations, and request for refund and damages through which the IRS and all related co-conspirers are officially being placed on Actual and Constructive Notice, and request this affidavit and attachments be added to my Individual Master File and previous affidavits: This is additional legal evidence of non-disclosure or lack of FULL disclosure of related facts by the IRS and other parties, and their continued constructive fraud against me. (Emphasis mine throughout affidavit and attachments). In years past, I had been influenced and misled by the news media, including IRS press releases, tax preparers and by a misinformed public, into believing that I was subject to and liable for the so-called "income" tax, and that if I did not file Form 1040 Income Tax Returns and other IRS forms and documents by the April 15th deadline I would be subject to a fine and jail sentence. I no longer believe this to be Constitutional, legal or true in the slightest, and believe that the IR Code (See Attachment F) DOES not provide "Plain and Clear" "income" tax liability (See Attachment FF) documentation for most Americans. I have also learned and believe that the so-called "social security" tax was fraudulently presented to the American Public as an "insurance" trust fund, with funds to be kept in a separate account for all Americans, and yet is just another unconstitutional and illegal tax on most Americans, and that these funds are simply added to the general government account, thereby eliminating any such "fund" from real existence, and deceiving the public with continued dialog regarding such fund. The "Medicare" tax is also another unconstitutional, illegal tax. (See Attachment M). I had also been influenced by employers who indiscriminately require individuals to sign W-4 forms (Employee's Withholding Allowance Certificate) and provide social security numbers in order for the individuals to obtain jobs, but have come to learn that this is being fraudulently enforced, and that a SSN is NOT required for employment or for personal bank accounts. (See Attachment M). I have since learned and believe that only by the ignorant, voluntary signing of tax forms and the providing of a "social security" number does an "individual" seemingly create the necessary prima facie evidence (whether factually true or not) indicating that he believes he is a "person" who is legally subject to and liable for an "income"tax. I rescind this for all past activity, and if such SSN is requested for any future activities that I must engage in to adequately carry on my daily living, I do not give up any rights per UCC 1-207/308 or other related code law, or do not agree that said SSN is tied to me as a free sovereign as a privilege, nor do I accept any benefits by being asked or required to providing said "social security" number to any party for any reason. (See Attachment M). I have since learned and believe that the Internal Revenue Code states exactly who is liable for other taxes such as the excise tax on distilled spirits, clearly stating that the distiller or importer of distilled spirits shall be liable for the taxes imposed thereon (26 U.S.C. 5005(a)), and that I find no section in the Internal Revenue Code making me personally liable for any "income," "social security" or "medicare" tax whatsoever. I have since learned and believe that the Internal Revenue Code relates only to those who are "taxpayer(s)" as that term is defined therein, that is, only those who are subject to or liable for a revenue tax (26 U.S.C. 1313 (b) and 7701 (a) (14); or who knowingly, with full understanding, volunteer to pay such taxes. I am NOT such a person. "The revenue laws are a code or system in regulation of tax assessment and collection. They relate to taxpayers and not to non taxpayers. The latter are without their scope. No procedure is prescribed for non�taxpayers and no attempt is made to annul any of their rights and remedies in due course of law. With them Congress does not assume to deal, and they are neither of the subject nor of the object of the revenue laws. Persons who are not taxpayers are not within the system and can obtain no benefit by following the procedures prescribed for taxpayers... The distinction between persons and things within the scope of the revenue laws and those without is vital." Long v. Rasmussen, 281 F. 236 (1922) stated at 238: (Referenced in United States Court of Claims, Economy Plumbing and Heating v. United States, 470 Fwd 585, at 589 (1972)). (Emphasis Petitioners). I have since learned, and believe that IRC 26 was NOT enacted as "positive law," and therefore without legal jurisdiction (See Attachment X) over most Americans, and is being improperly and illegally imposed under the color of law, (See Attachment D) clearly making it constructive fraud. (See Attachment H). NOTE: Of the 50 titles, only 23 have been enacted into positive (statutory) law. These titles are 1, 3, 4, 5, 9, 10, 11, 13, 14, 17, 18, 23, 28, 31, 32, 35, 36, 37, 38, 39, 44, 46, and 49. When a title of the Code was enacted into positive law, the text of the title became legal evidence of the law. Titles that have not been enacted into positive law are only prima facie evidence of the law. In that case, the Statutes at Large still govern. U.S. Government Printing Office http://www.gpoaccess.gov/uscode/about.html, Statutes at Large meaning the actual laws/constitution rule, and the code itself has no legal standing in fact. I have since learned, and believe that the 1040 form is an illegal and facially void form used by the IRS. This form is lacking a valid OMB number. (See Attachment D). I have since learned and believe that the United States Supreme Court has been quite clear in stating that a so-called "income" tax is in fact an excise tax (Brushaber v. Union Pacific R.R. Co., 240 U.S. 1, 16-17 (1916), (see also South Carolina v. baker; 485 U.S. 505, 522 (1988); and (contrary to popular belief) the Sixteenth Amendment conferred no new power of taxation but simply prohibited such power of "income" taxation from being taken out of the category of indirect taxation to which it inherently belonged (Stanton v. Baltic Mining Co., 240 U.S. 103, 112 (1916)) and that it did not extend the taxing power to new or excepted subjects (Peck & Co. v. Lowe, 247 U.S. 165, 172 (1918)), and that an indirect tax is a tax laid upon the happening of an event, as distinguished from its tangible fruits (Tyler v. United States, 281 U.S. 497, 502 (1930), Knowlton v. Moore, 178 U.S. 41)), and that excise taxes (being in the category of indirect taxes) are imposed or laid upon certain activities such as the manufacture, sale or consumption of commodities within a country, the exercise of licenses to pursue certain occupations, and the doing of business in a corporate capacity (Flint v. Stone Tracy Co., 220 U.S. 107, 151 (1911)), and is an excise tax with respect to certain activities and privileges which is measured by reference to the "income" which they produce, and that the "income" is not the subject of the tax: it is the basis for determining the amount of tax (House Congressional Record, 3-27-43, page 2580). (See Attachment C). I have since learned and believe that "income" received for "labor provided," is NOT what the Founding Fathers, or Congress, originally considered it to mean, (original intent) and that the "exchange" of value (labor for cash or other compensation) provides nothing "materially different" that can be legally or Constitutionally "taxable" (See Attachment A). I have since learned and believe that the Oregon Supreme Court was quite clear when it said that the individual, unlike the corporation, cannot be taxed for the mere privilege of existing, and that the corporation is an artificial entity which owes its existence and charter powers to the State; but the sovereign individuals' rights to live and own property are natural rights for the enjoyment of which an excise cannot be imposed (Redfield v. Fisher, 292 P. 813, 819 (1930)). I have since learned and believe that the Tennessee Supreme Court was quite clear when it said that since the right to receive "income" or earnings is a right belonging to every human being, (sovereign - JTM) this right cannot be taxed as a privilege (Jack Cole v. MacFarland, 337 S.W.2d 453, 456 (Term. 1960)). (See Attachment C). I have since learned and believe that the acquittal of Whitey Harrell on 4 counts of criminal felony charges of willful failure to file an Illinois State Income Tax form in PEOPLE OF THE STATE OF ILLINOIS vs. GAYLON L. HARRELL, Case Number 97CF89 in the Circuit Court of the Twentieth Judicial Circuit, St. Clair County, Illinois, (2000) was based on the true law, and that the State of Illinois did NOT and COULD not show the actual law which required Mr. Harrell to file an Illinois return because he was NOT liable for Federal Income taxes, just as I am not liable for Federal income taxes, and therefore, not liable for Colorado or any other State income taxes. I have since learned and believe that the acquittal of Vernice Kuglin of six counts of felony Tax Evasion and Willful Failure to File tax returns, in USA v. Kuglin, U.S. District Court, Western District of Tennessee (Memphis) # 03-CR-20111, (2003), was based on the true law, and that the IRS did NOT and COULD not show the actual law which required Ms. Kuglin to file a 1040 form, just as it has not shown me. I have since learned and believe that the acquittal of Joseph Banister of 4 counts, in United States of America v Joseph Banister, et al., CR No. S-04-435, (2005) was based on the true law, and that the IRS could NOT show the law, or other legal or constitutional proof of guilt because there was none. I have since learned and believe that the acquittal of Tommy K. Cryer of two counts of willful failure to file, in United States of America v Tommy K. Cryer, No. 06-50164-01, Western District of Louisiana Shreveport Division, (2007) was based on the true law, and that the IRS could NOT show the law, or other legal or constitutional proof of guilt because there was none. I have since learned and believe that sections 6001 and 6011 of the Internal Revenue Code which indicate requirements to keep records and make returns apply only to those persons who are liable for or made liable for a tax (26 U.S.C. 6001, 6011). I am NOT such a person. (See Attachment F). I have since learned and believe that section 6012 of the Internal Revenue Code which also indicates a requirement to make returns relates only to so-called "income" taxes under Subtitle A of the Internal Revenue Code (26 U.S.C. 6012) and additionally relates only to persons who have "taxable year(s)" ("taxpayer's annual accounting periods") as that term is defined in the Internal Revenue Code (26 U.S.C. 441(b)). I have since learned and believe that capitation taxes and taxes on profit FROM personal property (ANY personal property), wages and income being personal property, is in the category of direct taxes which must be apportioned among the States as required by the United States Constitution (Penn Mutual Indemnity Co. v. C.I.R., 277 F.2d 16, 19-20 (3rd Cir. 1960); Steward Machine Co. v. Davis, 301 U.S. 548, 581-582 (1937)). I have since learned and believe that since capitation taxes and taxes on profit FROM property must be apportioned among the States in accordance with the United States Constitution, and neither the so-called "income" tax nor the so-called "social security" tax is apportioned among the States, they must therefore be in the category of indirect taxes which are taxes imposed on the happening of an event or activity (Tyler, supra), and since I do not find a tax imposed on any of the activities that I am involved in, nor do I find a section in the Internal Revenue Code that makes me subject to or liable for any tax, I must be without the scope of the revenue laws and, therefore, have absolutely no legal duty to sign any tax forms of any sort or make any return or report of "income" or pay any "income" or "social security" tax or keep any records or supply any information to the Internal Revenue Service whatsoever. (See Attachment A). I have since learned that even though the index for Title 18 (the U.S. Criminal Code) lists crimes applicable to offenses involving firearms taxes, liquor taxes and tobacco taxes, no criminal offenses are listed for "income" taxes. Under the entries for the categories of federal alcohol, firearms and tobacco taxes, each contains sub-entries linking them to the specific US statutes enabling enforcement of such taxes by imposing legal sanctions for "failure to file or pay tax," "penalties," "record keeping," etc. Related entries also show clear references to "liability," "payment" and "tax on making," etc. No such entries can be found in the index entries under the category for "Income taxes." This means that none of the enforcement provisions of the Internal Revenue Code apply to "income" taxes, but only to Alcohol, Tobacco, and Firearms, and to such other taxes that are implemented by the regulations contained in CFR 27. I am a Colorado state de jure citizen domiciled in a "foreign" country relative to the United States, and am NOT subject to Federal income filing requirements. (See Point 21 and 42 below). I have since learned and believe that, Per 26 USC 7701(a)(12)) a Delegation Order from the Secretary of Treasury delegating to the Commissioner of Internal Revenue the authority to collect "income" taxes, and (per 44 USC 1505) a copy of its publication in the Federal Register, which is legally required, simply does not exist and has not been provided although requests have been made to the IRS for such publication. I have learned that the Federal Government, and hence, the IRS, has very limited jurisdiction within the sovereign 50 states, pursuant to Article 1, Section 8, Clause 17 of the Constitution. This means the IRS has NO jurisdictional authority over ANY sovereign de jure citizen of the several states, and therefore ANY IRS action against any sovereign citizen is illegal and only under the color of law. (See Attachment B). I have also found in IR Code research that most Americans are "nonresident aliens," but ONLY in regard to the corporate "United States." De jure State Citizens are legally "nonresident aliens" with respect to the municipal jurisdiction of the federal government, and that is the major reason why they are NOT embraced by the legal definition of "U.S. Persons." This further clouds the issues and indicates that most Americans are NOT subject to "United States" (a corporate entity consisting of federal territories such as Washington, D.C., Puerto Rico, etc.,) "income" taxes, and therefore, not required to pay income tax unless working for the Federal Government, a privilege for which taxation may be required. (See Attachment B). I have since learned and believe that both the United States Congress and the Internal Revenue Service use names and definitions in a deceiving way and that the common understanding of these names is misleading and causes misunderstandings and confusion when trying to establish actual individual tax liability. By deceptive and misleading words and statements in the Internal Revenue Code, IRS publications and news releases, the IRS has, by means of constructive fraud, deceived me, as well as the general public, into believing that Congress had imposed a direct tax on our earnings when in fact only persons involved in a taxed activity or event could possibly be subject to or liable for an unapportioned tax, and by such deception, have created the greatest extortion ever perpetrated upon a nation of free people in the entire history of the world. (See Attachment A). I have since learned that an artificial entity with my same name, known as "(name if all cap letters)," IN ALL CAPS (The "straw man" - See Blacks Law Dictionary, 4th edition), was fraudulently created for me (and all Americans) at the time of birth, and that such artificial entity is a corporate fictional entity through which the Federal Government has been "doing business" with the real "me," and yet deceptively misinforming me as to my liability for said artificial entity. (See Attachment N). I have since learned and believe that the United States declared bankruptcy in 1933, (HJR 192) (See Attachment Z) which began the removal of legal tender as defined in the Constitution, forcing me, today, to pay a debt WITH a debt, (Federal Reserve Note - see point 34 below) (See First National Bank of Montgomery vs. Jerome Daly) which is illegal. I also have learned that under the Uniform Commercial Code (UCC), and because of House Joint Resolution 192, that I have a legal "remedy" against the affects of the artificial entity, so provided for by Congress, and signed by the President, which I base this affidavit on. A UCC-1 has been filed with the Secretary of State of Colorado and Iowa, and accepted. (Copies attached). I also reserve all rights to myself if I am compelled, and left with no reasonable recourse, but to use Federal Reserve Notes as "payment" of supposed debt, and do not accept this as a "privilege." Any and all presentments from the IRS are dishonored, and ANY previously signed forms, contracts, letters of any kind, or other agreements made under the color of law, I hereby rescind my signature to. I am among the sovereign national citizenry of the United States of America, and a de jure citizen/national of Colorado and claim all right as a sovereign. I have since learned and believe that the 16th Amendment was not legally ratified as required by the Constitution. (See Attachment Y). I believe I am NOT "willfully" evading legal taxation: In the Supreme Court Case "CHEEK v. UNITED STATES, 498 U.S. 192 (1991), the court states: "Willfulness, as construed by our prior decisions in criminal tax cases, requires the Government to prove that the (1) law imposed a duty on the defendant, (2) that the defendant knew of this duty, and (3) that he voluntarily and intentionally violated that duty." There are three essential elements to the crime of tax evasion, namely (1) willfulness; (2) existence of a tax deficiency; and (3) an affirmative act constituting an evasion or attempted evasion of the tax. Sansone v. United States, 380 U.S. 343, at 351, 85 S.Ct. 1004, at 1010 (1965); United States v. Bishop, 264 F.3d 535 (5th Cir. 2001); United States v. Dack, 747 F.2d 1172, at 1174 (7th Cir. 1984); and United States v. Mal, 942 F.2d 682, at 687 (9th Cir. 1991); United States v. Silkman, 156 F.3d 833 (8th Cir. 1998). See also Lawn v. United States, 355 U.S. 339, at 361, 78 S.Ct. 311 (1958). (See Attachment F). My acts are not "willfully" criminal, under law, but ARE patriotic and in defense of my countrymen and my oath to defend the Constitution. I have repeatedly petitioned the IRS and other government officials, including Senators and Representatives, for answers to these and hundreds of other questions, and to provide answers to or rebuttal to, my affidavits over the last 4+ years, but no relevant answers have been forthcoming, and I therefore stand on my position and belief as being true, by default, and all I have presented is entered into the public record declaring this belief. Documentation available. I also obtained my Individual Master File (IMF) through the Freedom of Information Act (F.O.I.A. ), and believe it contained illegal, human-entered entries which overrode the computer programming, creating a false tax liability against me. It also indicated that the "Social Security" number assigned to me was in use by at least one other person, and that I was living in a foreign country, among other incorrect entries, which I rebutted, and yet received no acknowledgment of such corrections. I have since learned, proven and believe that the IRS is acting outside its authority, under the color of law, using constructive fraud, intimidation and force, to illegally extort money from most Americans. This constitutes treason. (See Attachment D). I have since learned and believe that the IRS is committing mail fraud (Title 18, Part I, Chapter 63, 1341) in EACH use of the U.S. Mail service to correspond with Americans in attempts to extract "income" taxes contrary to law, such as the "Notice of Levy" mailed to me and to my banking institution where no actual legal levy existed. (See Attachment QQ and See Attachment Q). I have since concluded and believe that IRS efforts to force me to break the law and the Constitution of America is a violation of my sovereign right to practice my religion freely according to my personal beliefs by attempting to force me to lie, commit fraud and disobey the supreme laws of the land as commanded against by God and the bible. My sovereignty is God-granted and Constitutionally supported, and cannot be legislated away. (See Attachment L). I have since learned and believe that this fraudulent financial system of fiat/fake money creation and wealth collection system between the Federal Reserve, IRS and U.S. government is completely unbiblical, unethical, unlawful and contrary to my religious beliefs regarding finances and dealing with others which I've held for over 25 years, and that it is directly responsible for subjugating people and nations, and allows the massive illegal and unconstitutional spending by the U.S. government and Congress, including illegal, unethical wars. This constitutes treason. (See Attachment I). I have since learned and believe that all Government agencies and individuals that are countering the Constitution of the United States of America are committing treason, at the very least, and are to be classified as domestic enemies (terrorists) of the Constitution and of the American people, which I am bound to resist and expose. I am a disabled Navy Veteran, who took an oath to uphold the Constitution from all enemies foreign AND domestic as part of my defense of my country, and am still bound to that, even though my active service was cut short by the injury. I am upholding that oath by educating others through this affidavit and my firm belief in what I understand about the laws as written. Since 2004, I have been a Plaintiff in a class action law suit, "We The People vs The U.S. Government." This suit challenges the IRS, among other branches of government, under the First Amendment right to "Redress of Grievance," to answer these and other questions brought forth before any more money is released to the government. "If money is wanted by rulers who have in any manner oppressed the People, they may retain it until their grievances are redressed, and thus peaceably procure relief, without trusting to despised petitions or disturbing the public tranquility." Journals of the Continental Congress. 26 October, 1774-1789. Journals 1: 105-13. I hereby retain any monies until legal and constitutional answers are provided. This suit provides MORE prima facie evidence that I firmly believe the government to be illegally and fraudulently applying the "income" tax system, and is involved in other illegal and unconstitutional acts and supports my actions. I am hereby including some of the relevant sources for the support of the enclosed affidavit on the illegal IRS activities, as well as other illegal activities, including web pages and books on these subjects. (See Attachment E.
I am NOT a "tax protestor," and not "anti-government." I AM anti-corrupt, illegal government, anti- illegal/unconstitutional taxes, and against fraud and unconstitutional activity by any. I pay taxes in many forms. I have since learned and believe that property taxation of private homes and other personal property is unconstitutional since it is NOT being apportioned nor is it uniform across the states. This makes it void and unenforcable by law. I have since learned and believe that sales taxation as it is being applied today is unconstitutional since it is NOT being apportioned nor is it uniform across the states, but rather is varied. 13th. Amendment (The Second 13th Amendment... (See Attachment K) to the U.S. Constitution states in Section 1. "Neither slavery nor involuntary servitude, except as a punishment for crime whereof the party shall have been duly convicted, shall exist within the United States, or any place subject to their jurisdiction." Being forced to pay taxes on my own "exchanged" labor (See Attachment A) is to place me in "involuntary servitude," making me a slave to the government and is another violation of the Constitutional requirements for taxation, and of my rights. (See Attachment J). I have learned and believe that the FIRST 13th Amendment provides proof of lacking jurisdiction and authority of B.A.R. (standing for British Accredited Registry by some authorities) attorney and judge proceedings over me, (or any), as a sovereign de jure citizen of the several states of America, and I question the validity of ANY "BAR" member as a constitutionally legal attorney or judge to be trying me or defending my constitutional interests as an American. (See Attachment K). I have reason to also believe that IRC 1.861-8 "Computation of taxable income from sources within the United States and from other sources and activities" reveals that "taxable income" being discussed is relevant ONLY to International citizens living in the U.S. receiving payment for work. I have since learned and believe that the IRS has consistently used "terrorist" (TITLE 18, USC > PART I > CHAPTER 113B > 2331. Definitions, domestic terrorism, #5) procedures to force, coerce and intimidate people into paying income taxes; and has and is performing unconstitutional and illegal searches and seizures in its approximate 94 years of existence. Its own code comments on such "TERRORISM": Terrorism = "the unlawful use of force and violence against persons or property to intimidate or coerce... the civilian population, or any segment thereof, in furtherance of political or social objectives." This constitutes treason. (28 CFR 0.85(l), I, TITLE 18 USC > PART I >CHAPTER 115 - TREASON, SEDITION, AND SUBVERSIVE ACTIVITIES). I have since learned and believe that the "United States," as defined in IR Code, is NOT the same as "United States of America," (USA is defined as the 50 sovereign states NOT under U.S. jurisdiction) as defined in the IR Code, and that ONLY "United States" 'citizens' i.e. ONLY those living within the jurisdiction of the "United States" such as Washington D.C., Guam, Puerto Rico and other possessions of the "United States," could "possibly" be liable for "income" taxation as IR Code hints at, also barring other significant evidence to the contrary. (See Attachment B). I have since learned and believe that all court actions by the IRS have excluded proper Due Process, ( See Attachment Q) without a "Fully Informed Jury," (as to their rights and duties under the law, to both judge the actual facts as well as the law itself, and vote their conscience), and that this and other vital legal relevant material evidence has been withheld, suppressed or objected to, contrary to Constitutional and Common Law rights. (See Attachment G). I have since learned and believe that most courts in the U.S.A. are NOT Article III courts, and therefore have no jurisdiction over sovereign states or sovereign de jure human beings, and that ONLY actual Article III courts, or the Supreme Court, has jurisdiction over such. (See Attachment K). Research to date proves that I, nor anyone else I know or have ever known, have ever voted for income taxation nor would they approve of income taxation should they know and understand the legal facts, and the fraud, which has been unfolded across the decades, and the actual vast amount of unconstitutional spending and activities by government. There is hereby also entered, inclusive of this entire document, an "Affidavit Denying Existence of Corporation" ("Specific Negative Averment") per Federal Rules of Civil Procedure, III. PLEADINGS AND MOTIONS, Rule 9, Pleading Special Matters. (See Attachment N). I have also been provided evidence on a massive scale that the U.S. government was involved in illegal and criminal activities surrounding the 9/11 attacks, and other crimes, which I must declare by material knowledge, and belief of, or be liable in the continuing cover-up. These actions by the government constitute treason, and support IRS illegal activity allegations as well. (See Attachment O). I have since learned and believe that all my personal property such as land, buildings, vehicles, etc., under Common Law and in regard to free sovereigns is "allodial" property, owned free and clear of all encumbrances when illegally contracted, and without full disclosure. (See Attachment P). "For a crime to exist, there must be an injured party. There can be no sanction or penalty imposed upon one because of this exercise of Constitutional rights. "- Sherar v. Cullen, 481 F. 945. Under this case law, and the rule of "corpus delicti," there is a lack of an injured party (except for injury to myself) and a lack of standing, since there is no evidence of a legitimate complaining party who also has a legitimate claim for damages. There is, therefore, no jurisdiction over me by the IRS, and no legal standing. (See Attachment B). This affidavit and attachments is meant to reserve all my rights, and cover ALL additional illegal and unconstitutional laws and procedures (now or ever) against me not specifically mentioned in this document or known at this time, and I base any and all rights under organic and other pertinent laws, National or International, in perpetuity. I also provide this entire document as "Prima Facie" (See Attachment F) evidence of fraud and criminal activities, to be acted upon by legal authorities. All government employees (Federal or State) and all legislated laws are subject to the Constitution and are legally bound to uphold it in all activities: "This Constitution, and the laws of the United States which shall be made in pursuance thereof;... shall be the supreme law of the land; and the judges in every state shall be bound thereby... The Senators and Representatives and members of the State legislature, and all executive and judicial officers of the United States and the several States, shall be bound thereby, anything in the Constitution or laws of any State to the contrary notwithstanding." The Constitution of the united States of America, Article VI, Cl 2, 3. "The United States is entirely a creature of the Constitution. Its power and authority have no other source. It can only act in accordance with all the limitations imposed by the Constitution." - Reid v Covert 354 US l, 1957. "State officers may be held personally liable for damages based upon actions taken in their official capacities." Hafer v. Melo, 502 U.S. 21 (1991). Disputable presumption: "A species of evidence that may be accepted and acted upon when there is no other evidence to uphold contention for which it stands; and when evidence is introduced supporting such contention, evidence takes place of presumption, and there is no necessity for indulging in any presumption. A rule of law to be laid down by the court, which shifts to the party against whom it operates the burden of evidence, merely." Black's 6th Law Dictionary. This affidavit and attachments provides such evidence of "disputable presumption." I have since learned and believe that the filing of a 1040 violates my 5th Amendment rights of self incrimination due to the fact that the 1040 form can be used against me in a court of law, and due to the fact that IR Code and constitutional law reveal only federal employees, foreign based finance recipients, and "income" from asset recipients are subject to lawful, constitutional forms of "income" taxation, none of which I am and which, by signing a 1040 form, I am attesting that I am. I have learned and believe the 8th Circuit Court's precedence that the lack of IRS or government response to this affidavit creates a presumption against the government, as follows: "The law creates a presumption, where the burden is on a party to prove a material fact peculiarly within his knowledge and he fails without excuse to testify, that his testimony, if introduced, would be adverse to his interests." Meier v CIR, 199 F 2d 392, 396 (8th Cir. 1952) quoting 20 Am Jur, Evidence Sec 190, page 193. No such material facts have been presented despite repeated requests. . . I am not in receipt of any documentation showing any income tax assessment from the IRS any other government office. I am not in receipt of any documentation proving that the U.S. government has authority to create fiat, paper money that is NOT backed with gold or silver. I am not in receipt of any documentation in rebuttal to my Individual Master File (IMF) changes as filed with the IRS. I am not in receipt of any documentation proving that income is all that comes in and that wages, salaries and compensation of any kind for labor is legal "income" in fact. I am not in receipt of any documentation proving that the IR Code is Positive law. I am not in receipt of any documentation showing the actual nature of what type of tax "income" tax falls under. I am not in receipt of any documentation proving that the 16th Amendment created a new classification of taxation allowing the IRS/government to tax as they are. I am not in receipt of any documentation showing what "activity" I am engaged in that is taxable under IR Code. I am not in receipt of any documentation proving that "voluntary assessment" means mandatory assessment required by law. I am not in receipt of any documentation proving that the IRS has legal authority to directly tax my income or property without apportionment. I am not in receipt of any documentation proving that the IR Code provides for enforcement of income taxation, like it does for alcohol, tobacco and firearms. I am not in receipt of any documentation refuting the fact that the "United States" is a corporation and is NOT the same entity as the united States of America. I am not in receipt of any documentation proving that I am NOT a nonresident alien in regard to the corporate United States. I am not in receipt of any documentation proving that the United States has legal jurisdiction over me as a sovereign Colorado state citizen. I am not in receipt of any documentation proving that the straw man name (name) is the same legal, free, sovereign flesh and blood human, (name). I am not in receipt of any documentation proving that a "Notice of Lien" is the same legal document as a "Lien." I am not in receipt of any documentation proving there is any known Act of Congress, or any Executive Order, giving IRS lawful jurisdiction to operate within any of the 50 States of the Union. I am not in receipt of any documentation proving that social security is an actual trust account set up separate from the general accounts, and that it is mandatory for participation in this scheme. I am not in receipt of any documentation refuting the fact that my labor is given in exchange for an agreed upon wage, salary or other compensation, that this compensation, wage or salary is legal income, and that it is NOT an equal exchange of two assets or property, providing no material difference in value. I am not in receipt of any document that verifies I am a "citizen" of the United States of America a corporate entity owned by the United States. I am not in receipt of any document that verifies I am a "citizen" of the District of Columbia, Puerto Rico, the Virgin Islands, Guam, American Samoa, the Northern Mariana Islands, or any other "federal territory," "federal area" or "federal district." I am not in receipt of any document that verifies I am a "citizen" of the "STATE OF COLORADO." [The "STATE OF COLORADO is a incorporated, shadow, federal "State," a "political subdivision of the U.S." created by the 1940 Buck Act. The 10th Amendment and the Separation of Powers Doctrine prohibits the state "Republics" from acquiescing to federal authority, thereby functioning as federal States, without a constitutional amendment which specifically delegates authority to the United States which is not already articulated in the "Constitution for the united States of America" see New York v. United States, et all, 1992]. I am not in receipt of any documents proving that the "State of Colorado" is the same legal and Constitutional entity as the Constitutionally-sovereign territory called "Colorado state" which contains free, sovereign citizens NOT subject to U.S. or corporate State interests. I am not in receipt of any document that verifies I am a "citizen" of the political coalition, compact or alliance of territories and insular possessions of the United States known as the "UNITED STATES," "UNITED STATES OF AMERICA" or the "STATE OF COLORADO." [Not to be confused with the Union of States the parties to the Constitution originally known as the united States of America, established in the Articles of Confederation] [See notes following 18 U.S.C. 1001; 40 Stat. 1015, c. 194]. I am not in receipt of any document that verifies I am a "United States citizen living abroad" as defined in 26 U.S.C. I am not in receipt of any document that verifies I am subject to the "UNITED STATES" or "UNITED STATES OF AMERICA." I am not in receipt of any document that verifies I am a member of the corporate body politic of any state or federal government. I am not in receipt of any document that verifies I am a "resident" of the "UNITED STATES OF AMERICA." I am not in receipt of any document that verifies I am a "resident" of the District of Columbia, Puerto Rico, the Virgin Islands, Guam, American Samoa, nor the Northern Mariana Islands, nor any other "federal territory," "federal area" or "federal district." I am not in receipt of any document that verifies I am a "resident" of the corporate/federal "STATE OF COLORADO." I am not in receipt of any document that verifies I am a "resident" of the political coalition, compact or alliance of territories and insular possessions of the United States known as the "UNITED STATES," "UNITED STATES OF AMERICA" or the "STATE OF COLORADO." I am not in receipt of any document that verifies my dwelling place is in the "UNITED STATES." I am not in receipt of any document that verifies my dwelling place is in the "UNITED STATES OF AMERICA." I am not in receipt of any document that verifies my dwelling place is in the "STATE OF COLORADO." I am not in receipt of any document that verifies I am a "resident alien" lawfully admitted to a state of the Union. I am not in receipt of any document that verifies I am a "resident alien" lawfully admitted to the "UNITED STATES." I am not in receipt of any document that verifies I am a "resident alien" lawfully admitted to the "UNITED STATES OF AMERICA." I am not in receipt of any document that verifies I am a "resident alien" lawfully admitted to the District of Columbia, Puerto Rico, the Virgin Islands, Guam, American Samoa, nor the Northern Mariana Islands, nor any other "federal territory," "federal area" or "federal district." I am not in receipt of any document that verifies I am a "resident alien" lawfully admitted to the corporate "STATE OF COLORADO." I am not in receipt of any document that verifies I am a partnership, corporation, estate, fiduciary or trust as defined by 26 U.S.C. I am not in receipt of any document that verifies I am an "officer," "employee" or "elected official" of the following: (1)"UNITED STATES," (2) "UNITED STATES OF AMERICA," (3) of a "State," (4) of any political subdivision thereof, (5) of the District of Columbia, (6) of any agency or instrumentality of the foregoing, or (7) an "officer" of a "United States corporation"; as those terms are defined and used within the 26 U.S.C. I am not in receipt of any document that verifies I am a "policy-making office-holder in the government." I am not in receipt of any document that verifies I am working abroad earning foreign income. I am not in receipt of any document that verifies I am a 14th Amendment citizen. I am not in receipt of any document which verifies I am "subject to" nor dependent on the "quasi contractual" or "adhesion contract" social insurance trust / charitable trust / constructive trust created by the 14th Amendment. I am not in receipt of any document that verifies I am a constructive beneficiary of the 14th amendment public/private trust. I am not in receipt of any document that verifies I am "subject to" the "public debt" the 14th Amendment established. My "Rights" do not come from the 14th Amendment. I am not in receipt of any document that verifies I am a "person" as used within 26 U.S.C. [maxim - Homo vocabulum est naturae; persona juris civilis 'man' is a term of nature; 'person' is a term of civil law.] [Black's Law Dictionary, Revised Fourth Edition, "PERSON" Term may include artificial beings, as corporations relating to taxation and the revenue laws, People v. McLean, 80 N.Y. 254. A person is such, not because he is human, but because rights and duties are ascribed to him. The person is a legal subject or substance of which the rights and duties are attributes.]. I am not in receipt of any document that verifies I hold the legislatively created office of "person" or "individual" within the government. I am not in receipt of any document that verifies I am subject to Internal Revenue Service tax audit(s)/check(s) authorized by Treasury Order 150-29. I am not in receipt of any document that verifies I am a "juristic entity," "resident agent," "corporate entity," "individual entity," "property," "franchisee of the federal government," "bankrupt person," "human resource," "institutional unit," "private enterprise," "private law merchant," "employee," "employer," "withholding agent," "government employee," "constructive trustee," "implied trust," "private charitable trust," "disenfranchised entity," "enfranchised entity," "incompetent," "civilly dead," "surety for any fiction," "guarantor for any fiction," or any other commercial label. I am not in receipt of any document that verifies I was created by the "United States," "Great Britain," "United Nations," any government created trust, or any government/corporate entity. I am not in receipt of any document that verifies I am "subject to" the "United States," "Great Britain," "United Nations," any government created trust, or any government/corporate entity. I am not in receipt of any document that refutes or rebuts, point by point, the previous questions, challenges and facts in evidence provided to the IRS. I am not in receipt of any document that refutes or rebuts, point by point, the previous questions, challenges and facts in evidence provided to the U.S. Department of the Treasury. I am not in receipt of any document that refutes or rebuts, point by point, the previous questions, challenges and facts in evidence provided to the Commissioner of the IRS. I am not in receipt of any document that refutes or rebuts, point by point, the previous questions, challenges and facts in evidence provided to my Colorado Representative, Ken Salazar. I am not in receipt of any document that refutes or rebuts, point by point, the previous questions, challenges and facts in evidence provided to the U.S. Attorney General, Alberto Gonzales. I am not in receipt of any document that refutes or rebuts, point by point, the previous questions, challenges and facts in evidence provided to the Colorado Attorney General, John Suthers. I am not in receipt of any document that refutes or rebuts, point by point, the previous questions, challenges and facts in evidence provided to Colorado Department of Revenue. I am not in receipt of any document that refutes or rebuts the claim for refund of all monies extracted from me as stated in this and previous documentation. I am not in receipt of any document that refutes or rebuts the claim for monthly interest on unpaid refund as stated in this and previous documentation. The actions in IRS activities and enforcement clearly constitute financial fraud, which is supported by multiple layers of "associations" with the primary intent of taking assets from citizens and profiting the government. This need only be $1.00 in loss to fulfill this requirement. The actions have been ongoing, as proven by the ongoing efforts by the IRS yearly, and which many more than two similar acts have occurred to me personally. In addition, mail fraud, a Federal Crime, is also involved with this scheme daily. This is self evident in IRS correspondence, demands, printed material, court proceedings, etc. Pattern has been continuing for many decades and is growing worse. The only way it will stop is for the Rule of Law to be enforced and for constitutional rights to be enforced... In other words, oaths of office must be obeyed and not violated, creating even more criminal events in the way of treason against the American People. This is official notice that the IRS and named agencies are in default for not responding to the certified affidavit and notice dated March 25, 2006, certified mail #7005-2570 0002 2959 5402, requesting under FOIA verification of laws and answering other relevant questions. Because of this default, and the presumption of guilt due to silence, this is Demand for complete payment of all monies fraudulently stolen, and damages listed, along with interest which has accrued to date, based on precedence listed below, or as to be determined in a court of competent jurisdiction. Income Taxes fraudulently withheld, based on total Social security figures. "Frivolous Penalty" illegally removed from my bank account, $577.85 (See Attachment Q). Income Taxes extracted through constructive fraud since 1969 are NOT calculated in the total below, and are required as part of this settlement. 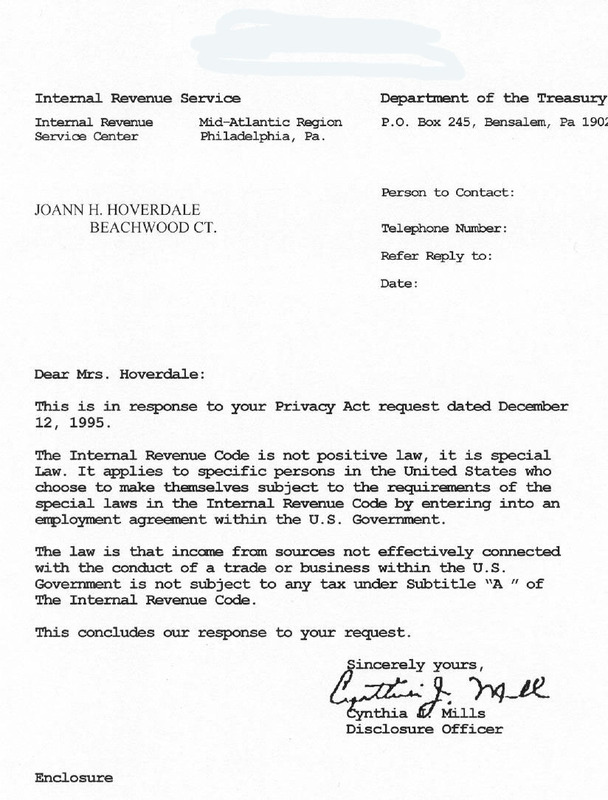 Forced Labor: Being forced, through this constructive fraud, to expend my personal and business time on unnecessary record keeping and form filing (valued at $50 U.S. dollars per hour), and amounting to 2000 hours since 1969, totaling $100,000 (See Attachment D), as well as 500 hours time for defending my legal and constitutional rights in having to respond to the IRS' correspondence, demands, accusations, etc., with legal briefs, memorandums, affidavits, etc., totaling $25,000. I hereby, with this notarized Brief and Memorandum of Law, affidavit, Notice and attachments, lay claim to all previous collected funds which the IRS fraudulently collected contrary to my legal and constitutional rights, plus the allowed-for compensatory and punitive damages as calculated above, and interest, and demand said funds in total payment to secured party, Jeffrey Thomas Maehr, or his heirs or assigns, in perpetuity. I am requesting that you respond with full payment with certified check in my natural name, or wiring of funds to an account of my choosing immediately, (both under immunity to prosecution). ALL the facts previously presented in this and previous affidavits and attachments, create a Security, (15 USC), and an accounts-receivable and make the IRS, and other agencies, permanently liable for all claimed amounts and damages, payable to me, or my heirs in perpetuity, until paid in full as allowed above. 5% interest per MONTH will continue to be required on all uncollected monies due me, till total claim is paid! I hereby affix my lawful signature WITH EXPLICIT RESERVATION OF ALL MY UNALIENABLE RIGHTS, WITH HONOR AND WITHOUT PREJUDICE, pursuant to U.C.C. 1-207/308 and U.C.C. 1-103.6 and other claimed rights under UCC Law, Common Law, Constitutional Law, and Law of Nations, or other appropriate laws, known or unknown. Jeffrey Thomas Maehr, a sovereign human being and de jure Citizen of Colorado state. VERIFICATION - This affidavit consists of main document, with attachments "A," "B," "BB," "C," "D," "E," "F," "FF," "G," "H," "I," "II," "J," "K," "L," "M," four (4) pages, "N," "NN," "O," "P," "Q," "QQ," "R," "S," "T," "U," "V," "W," "WW," "X," "Y," "Z," and "ZZ"! * Notice: All parties copied on this document are also "On Active and Constructive Notice." To disregard these legal challenges is to become legally complicit in the charges, and treason is the result. You must respond with point-by-point rebuttal, or, by default, (See attachment ZZ) do agree to the legal merits of this affidavit, and are held legally liable to these demands under U.C.C. Law, Common Law, Law of Nations, Organic Constitutional law, and God's law, as applicable. I, Jeffrey T. Maehr, do certify that I mailed this original certified document consisting of Brief and Memorandum of Law, Affidavit of Truth, Actual and Constructive Notice - Brief and Memorandum of RICO (Racketeering) Crimes, to the Internal Revenue Service, certified mail # ??? ?, and copies of original to the above named individuals, certified mail #'s listed above, all mailed on ???? ?, 2008. I, (Name), do certify that I mailed this original certified document consisting of Brief and Memorandum of Law, Affidavit of Truth, Actual and Constructive Notice - Brief and Memorandum of RICO (Racketeering) Crimes, to the Internal Revenue Service, certified mail # ??? ?, and copies of original to the above named individuals, certified mail #'s listed above, all mailed on ????? ?, 2008. This document in its entirety is published by Jeffrey T. Maehr, Copyright © 2006-2008 Rights to freely publish and use is given provided it is for personal, private party use and no monetary exchange is involved with the transfer of this document. (Other copyrights listed).